Another Halloween has come and gone, and instead of nursing my hangover while curled up in the bathtub, like I really wanted to, I'm tasked with entertaining you lot. It seems like a good year for costumes: we've seen some great ones, and we're asking for more, but what nobody's asked for is the Apple-themed costumes piling up in my inbox. First up is this surprisingly thorough mock-Apple ad from reader Cosmo. Sure, it's kind of DIY, but the dude painted his entire head and somehow dug up one of those ancient white iPods: white is so six months ago. My head hurts too much to think about why he's standing next to a giant cookie. And next is the self-described "nerdiest costumes this year," from reader Joe Kutilek. 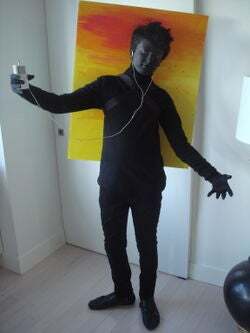 That's right, this is an iPhone Mac OS icon costume. It's like arts and crafts meets belly-painting sports fan, with a dash of dork.